QB Jimmy Garoppolo is now 2-0 in his 49ers starts, as the San Francisco 49ers defeated the Houston Texans 26-16 in NRG Stadium. Garoppolo finished 20-of-33 with 334 yards, also tossing an interception and a touchdown. He was aided by the performance of WR Marquise Goodwin, who had 106 yards on the day. RB Carlos Hyde chipped in 78 yards and a score on the ground to round out an all-around solid performance for the 49ers offense. QB Tom Savage was injured in the game, giving way to T.J. Yates in the second quarter. Yates finished the game 14-of-26 for 175 yards and two touchdowns. WR DeAndre Hopkins had himself a shining statistical game, catching 11 passes for 149 yards an both of Yates’ touchdown throws. However he lost a fumble as well. With that, we give you our PFF-exclusive takeaways from the contest for each team. 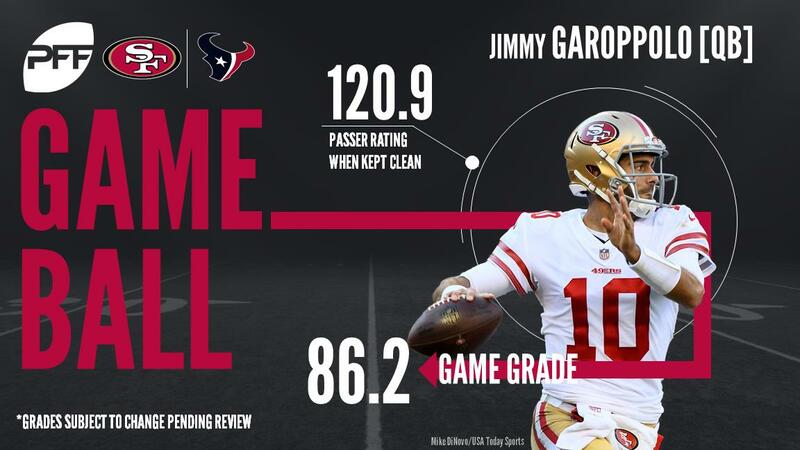 Garoppolo was virtually a one man show for the Niners, working well in the middle of the field and making impressive throws in the face of pressure. There were just a few mistakes throughout, one of them an errant throw under duress resulting in an interception early in the game. Garoppolo threw accurately at the intermediate part of the field, going 8-of-10 for 163 yards on throws traveling 10-19 yards. It was a mix of good and bad for Goodwin, as he dropped two passes on the game, but ended up making up for it with explosive plays in the passing game. Goodwin was Garoppolo’s top target, hauling in 6 of his 11 targets for 106 yards. Goodwins biggest play came on a crossing route where he made a catch in traffic between two defenders and took it for a 32 yard gain with a nice run after the catch. Buckner was back to his best against Houston. He was typically weak at the point of attack against double teams, but he can be forgiven for an indifferent performance at the point of attack when he is such a bullying pass-rusher. Buckner’s trademark bullrush served him well, in addition to his quick arm-over move to the inside. He managed seven combined pressures (two knockdowns), as he was in Houston’s backfield throughout the day. Dontae Johnson suffered at the hands of Hopkins. In total, he gave up 140 yards on nine catches (ten targets) and a touchdown. Those were only the plays that counted, however. Johnson was flagged three times in coverage, and resorting to fouls was really his only option. It could have been worse for Johnson, but he was benched before it could get too ugly and the 49ers’ defense improved as a result. He’s best off viewing his matchup with Hopkins as a learning experience. What a game this looked like it was becoming for Hopkins, who entered the fourth quarter with two touchdowns and closing in on 150 yards receiving. The final 15 minutes of action were not so kind, however, as the Texans’ wide receiver lost a fumble and dropped a pass. He was uncoverable at times, running a beautiful corner route into the back of the endzone for his second score. What a shame he undid much of his good work. The Texans’ right guard will be delighted to see DeForest Buckner get on the bus, as he wrecked Houston’s pocket from the interior in this game. In total, Mancz gave up a sack, hit and five hurries, earning a lowly pass-blocking grade of 23.1. He was simply overwhelmed for much of the game, struggling to pickup stunts in particular. Clowney wrecked the game up front single handedly against the run and rushing the passer, consistently forcing Garopplo to make throws under duress. Taking advantage of the Niners makeshift offensive line, Clowney finished the game with five hurries and four hits. Clowney impacted the running game no matter where he lined up, knifing through the backfield a number of times and totaling eight tackles and two solo stops. Although he was targeted only four times, Johnson struggled throughout the game. He allowed four catches on his four targets for a total of 57 yards, and struggled to make tackles to limit run after catch opportunities.